The world's richest nations are dumping hazardous electronic waste on poor African countries, says the head of the UN's Environment Programme (Unep). Speaking in Nairobi, Achim Steiner said consumerism was driving a "growing mountain of e-waste". Improper disposal of e-waste can release hazardous chemicals and heavy metals into the environment. Mr Steiner made his comments at the opening of a week-long conference in Nairobi which will review the Basel Convention, aimed at reducing the movement of all types of hazardous waste. "The need for Basel is ever more evident in this globalised world," he said. "Accelerating trade in goods and materials across borders and across continents is one of the defining features of the early 21st Century." E-waste is thought to be the fastest growing part of municipal waste in the developed world. 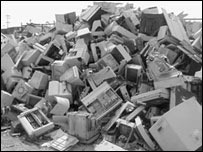 The decreasing cost of replacing computers, mobile phones and other electronic gadgets, and the speed with which technology goes out of date, mean there is more and more to be disposed of. Traditionally, much of the waste found its way to Asian countries such as China and India, but tighter regulations means more and more is ending up in Africa. A recent study by the Basel Action Network concludes that a minimum of 100,000 computers a month are entering the Nigerian port of Lagos alone. "If these were good quality, second hand, pieces of equipment this would perhaps be a positive trade of importance for development," said Mr Steiner. "But local experts estimate that between a quarter to 75% of these items including old TVs, CPUs and phones are defunct - in other words e-waste." When these are burnt, a common disposal method, it can release toxic fumes and leach chemicals such as barium and mercury into the soil. The conference will discuss how to tighten regulations to prevent this kind of incident occurring. In particular it will review amendments to the Basel Convention on the Control of Transboundary Movements of Hazardous Wastes and their Disposal which will tighten controls on shipments and disposal of e-waste. "We need to shine a brighter light on hazardous wastes - where they come from and where they end up," said Basel Convention Executive Secretary Sachiko Kuwabara-Yamamoto. The convention is meant to regulate waste in all of its forms, including e-waste. It came into force in 1992, and has since been signed by more than 160 countries. Members of the convention in Nairobi will also press those countries that have not yet ratified the treaty, such as the US, to do so. Also on the agenda will be a recent incident in Ivory Coast where noxious fumes produced by waste dumped around Abidjan killed at least 10 people and left more than 70,000 seeking medical treatment. Although there is no indication that the incident was caused by e-waste, the UN says the incident is indicative of the challenge facing African nations. "I sincerely hope that the tragedy in Cote D'Ivoire and the challenges of e-waste will serve as a wake up call to the Parties of the Basel Convention and other related treaties," said Mr Steiner.